Got hold of a couple of new bits of gear for GCHQ and thought we'd share some thoughts about 'em. First up this the MoogerFooger ring modulator, we've been after a moogerfooger for a while, this one came up secondhand at a reasonable cost (for once!) so we jumped at it. 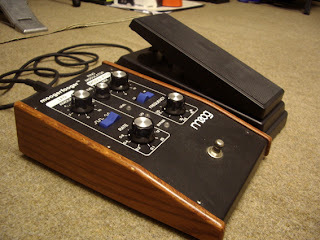 The black moog expression pedal was off Ebay and really adds a great live tweaking element. As well as the mad ring mod stuff this also does the best, creamy sounding tremello we've heard - good news for us, bad news for all the other trem pedals that have served us so well over the years. Last but no means least is a fuzz pedal by Devi Ever USA. Quite brutal sounding, osculating fuzz that sounds as good on guitar as it does on synths, especially our Roland SH101. 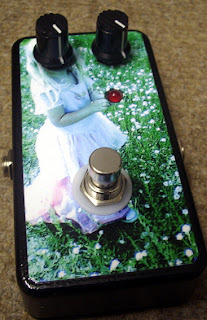 Devi's a really nice bloke too who makes small batches of hand built pedals and sells them via his Ebay shop .